Panasonic Corporation, the worldwide leader in the development of diverse electronics technologies and solutions along with Schneider Electric, the global specialist in energy management and automation, today announced an integrated HVAC equipment and building management solution that brings new levels of HVAC control and energy efficiency to today’s commercial buildings. Both companies have developed a new interface wireless solution which enables direct serial communication between Schneider Electric’s building management system and room controllers with Panasonic’s variable refrigerant flow (VRF)-based HVAC systems via the ZigBee® wireless communication standard. This integration allows building owners and managers to view all of their core building systems including HVAC equipment, lighting, security, power and electrical distribution anytime and anywhere via a single interface and delivers actionable insights to reduce energy consumption and drive savings. The joint Panasonic/Schneider Electric solution can be installed wirelessly – which preserves existing infrastructure and is ideal for retrofits of older buildings – or it can be wired. The solution takes full advantage of innovative plug-and-play technology which simplifies system configurations for extensive VRF systems – or it can be installed as a part of a stand alone system. This make it easy to install and allows system integrators to save time and costs on installation. In addition, facility teams have access to comprehensive energy reports and dashboards as well as Schneider Electric and Panasonic’s expert technical support teams to ensure that all systems are running at the highest performance levels at all times. VRF-based HVAC systems are becoming increasingly popular in commercial building settings because of their ability to operate at variable speeds by inverter technology instead of the traditional on/off operation, which drives significant energy savings. Panasonic’s VRF system (ECOi/FSV) is designed to dramatically increase energy efficiency by delivering the highest ESEER rating in all outdoor capacities, as well as high efficiency for part-load operations that accurately match the environment in which it is being used. The system is highly reliable, with strong cooling and heating power, even when operating at extreme ambient temperatures ranging from -25°C up to 52°C. Schneider Electric’s SmartStruxure™ building management solution maximizes building efficiency and reduces operating costs across the entire lifecycle of a facility by integrating customized hardware, software, engineering, installation and services to ensure facilities are energy efficient and effectively managed. It breaks down traditional information silos and delivers actionable insights in real-time so facility managers can make smarter decisions to optimize energy management. Additionally, Schneider Electric’s SE8000 Series room controllers, as part of SmartStruxure, combine a thermostat/temperature sensor and programmable room controller in a single unit to optimize the energy use of HVAC systems and help reduce operational costs. 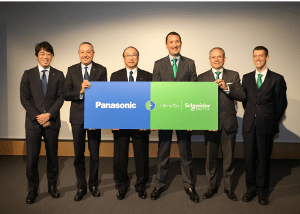 The joint Panasonic/ Schneider Electric solution is currently available in Worldwide except Japan market.